To see how project builders work, we will create a simple project with a single source file and an Ant buildfile that jars up the single class file. Though this example uses Java, it should be noted that project builders are available for all projects, Java or otherwise. Create a Java project named HW. Create a Java source file named HelloWorld with a main method. Put a single System.out.println() statement in the main method, and make it print a greeting of your choice. 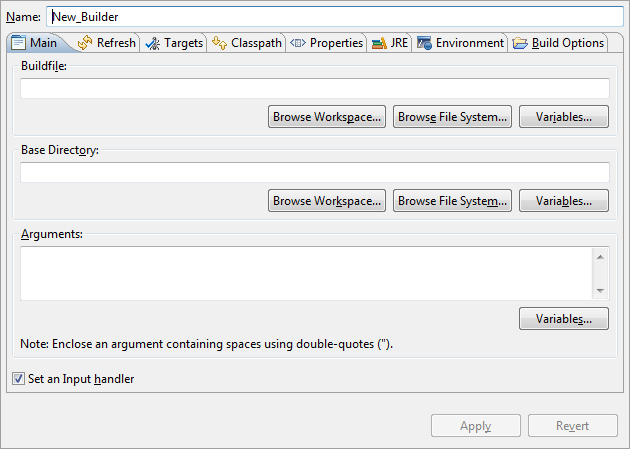 Create a file named projectBuilder.xml, open the Ant editor on it, enter the following content, and save changes. In one of the navigation views, select the HW project and choose Properties from its context menu. 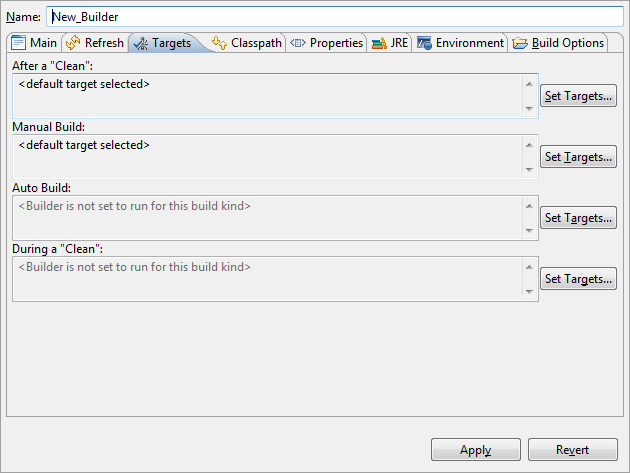 In the Choose configuration type dialog, select Ant build, and click OK. The External Tools dialog appears. Set the name to Makejar. In the Main tab, click the Buildfile Browse Workspace... and set the Location to be the projectBuilder.xml buildfile created above. Then click the Base Directory Browse Workspace... and set the Base Directory to be the HW project. In the Refresh tab, we want to be sure that when our HelloWorld.jar is created, we see it in Eclipse. By default, no refreshing is done when a project builder finishes running, so check Refresh resource upon completion, then select The project containing the selected resource in the list of scoped variables. Because refreshing can be expensive, you should, in general, refresh the smallest entity that contains all resources that will be affected by your buildfile. 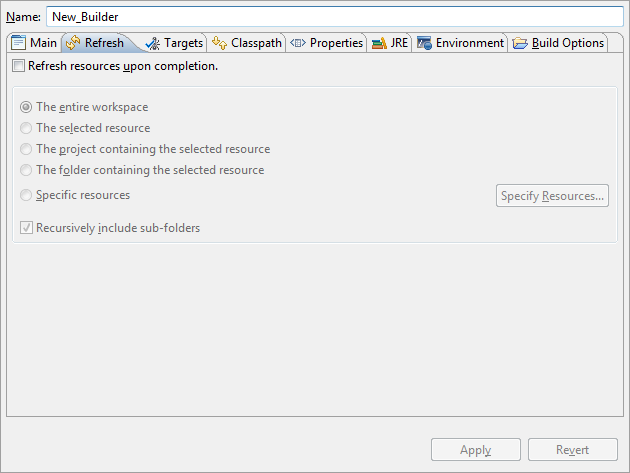 In the Targets tab, you can specify when this project builder is executed and which targets. By default, the default target is set to run After a "Clean" and Manual Build. You can specify other targets and other triggers. Running your project builder during auto builds is possible, though not recommended because of performance concerns. More information about the build kinds can be found here. 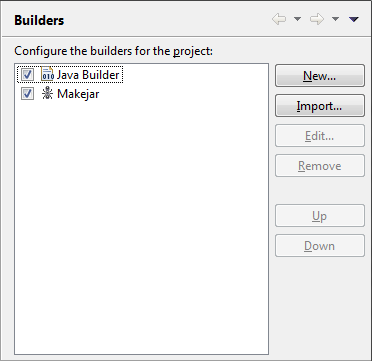 Back in the project properties dialog, you will now see a project builder named Makejar that is set to run after the default Java builder. Click OK to save the project builder and close the dialog. Note:You can change the order so that your Ant buildfile runs before the Java builder, though that wouldn't make sense in this example. The Java builder runs the internal Eclipse Java compiler which in turn is responsible for indexing your source so that searching, refactoring and many other features are available. Thus it is not possible to replace the internal Eclipse Java compiler by using a project builder. You can disable the Java builder and you can control when the Java Builder runs with respect to the project builders that you define.